Honored to be a guest speaker in Don George’s journalism class at St. Mary’s College in Moraga, California, I seized the opportunity to interview Mr. George after class. Don George wrote the book on travel writing, literally. 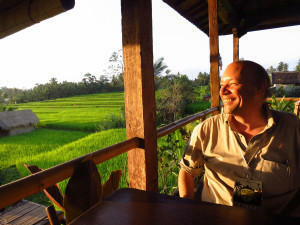 His guidebook, “Lonely Planet’s Guide to Travel Writing,” is the best-selling travel writing guide in the world. Don has been a travel writer and editor for more than three decades, starting out at the San Francisco Examiner & Chronicle and later working as the Wanderlust editor for Salon.com and as Global Travel Editor for Lonely Planet Publications. Today Don is Editor at Large for National Geographic Traveler and the editor of the BBC Travel column Words and Wanderlust. In this far-ranging conversation, Don talks with Tom Wilmer about the youthful moment in Paris that changed his life, how his goal transformed from being a poet to being a travel writer, the evolution of his career from newspapers to websites, his most memorable on-the-road epiphanies, and the larger meaning and purpose of travel and travel writing.